If you or a loved-one are living with memory loss, dementia or Alzheimer’s, we offer a secure and comfortable environment that maintains dignity and strengthens and celebrates life skills. Our 12-suite memory support neighborhood includes discrete security and a private garden to allow for safe enjoyment of the outdoors. Each suite is private and includes 500 square feet of living space, a living area, a kitchenette, and a full bathroom. Through the Alzheimer’s Association, most of Holly Creek’s team receives at least 8 hours of annual training through its Leaders in Dementia Care program. Holly Creek is one of the few senior living communities in Colorado that offers an on-site Snoezelen therapy suite. 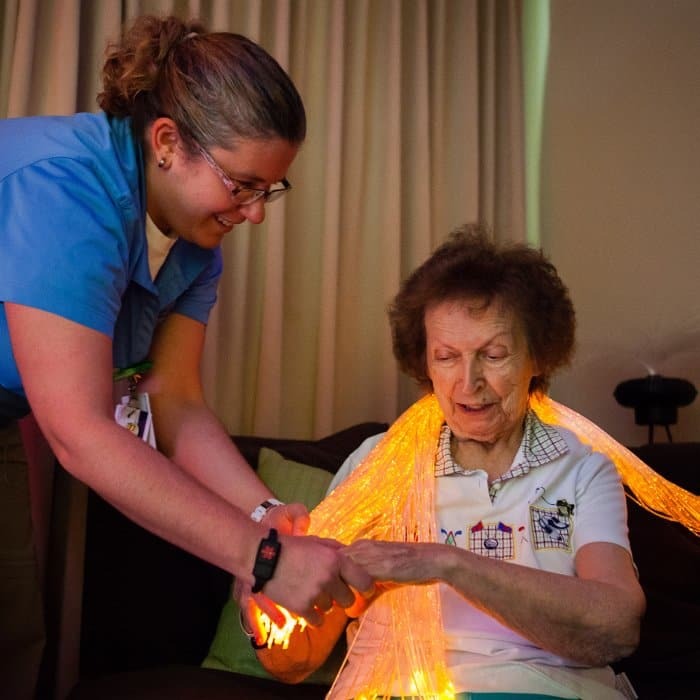 Beneficial to those with dementia or Alzheimer’s, Snoezelen blends sights, sounds, textures, aromas and motion to meet each participant’s sensory needs. Research shows just 15 minutes of Snoezelen therapy a day facilitates calm and relaxation, and strengthens communications and trust among the resident and caregiver.